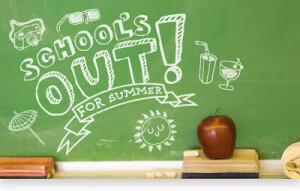 School’s out for summer and we’ve got it bad, so bad… Thinking of all that education you might be missing? We here at the Beacon House Inn know teachers and professors have worked hard all year for their quest of academia and it’s your time to slow down the clock and relish in the aspects of “feeling tardy.” Our Golden Rule?!! Book any 2 – 3 consecutive nights in our Bed & Breakfast Inn or the Cottages and receive 10% OFF room rates. Book any 4 – 5 consecutive nights and receive 20% OFF our room rates in the Inn or Cottages. This special is for teachers/professors only and valid from June 1 – September 15, 2014, Sunday – Thursday night stays only. Please bring your school ID to redeem this special and mention this when making your reservation. This special may not be combined with any other offers or discounts. Your homework was never quite like this. Book online or call the Inn today! CLASS DISMISSED!! !